This is an exciting post for me. Because I’ll be letting you know about some profound new opportunities to make the process of recording your songs even simpler. Along with my Easy Home Recording Blueprint this is the easiest and least expensive way to record your music yet. There are some new tools that have come to light that make this possible and for a few weeks now, my mind has been churning as I prepared this post for you and what it will mean to even more songwriters and musicians. This method and the specific tools I’m suggesting today will open up the door for the most tech-shy songwriters and even they will be able to get their songs recorded with a truly simple set of tools they can use with real confidence . Let’s look back for a minute first. Those of you who know my story about why I wanted to create the Easy Home Recording Blueprint method, know that it was based on my desire (obsession?) to totally simplify the process and therefore, and encourage as many musicians as possible to gain control of the process of making professional quality recordings. Musicians were the only artists (maybe matched by aspiring filmmakers), who faced a scenario where making their creations into presentable “works”, was, for the vast majority, almost impossible due to not only the huge expense, but also the mind-boggling technical know-how needed, just to truly complete and present their work. And, to be honest, at first this quest to simplify, was all about me and my situation, as I tried to figure out a way to stop the madness of spending thousands on recording studios and recording engineers just to get a few songs recorded properly. But, after I had succeeded in peeling away the layers, simplifying and then simplifying again, I realized that there must be thousands of songwriters out there whose songs were going to remain unheard. Some of them truly talented, who would remain only being able to dream of hearing their songs recorded clearly. And then I realized that, dammit, I wanted people to be able to hear those songwriters. So I made my simple approach to recording into a “method” that I could share. What I came up with, and what many of you reading this are using, is the Easy Home Recording Blueprint – to learn more about the Blueprint method click here. New Tools Mean We Can ALL Take Total Control of Recording Our Songs. Even simpler, less expensive equipment means that the Recording Blueprint method is more powerful than ever. Did you know this? When this goal of mine started (simplifying the recording process), I had actually pictured a personal recording studio that I could literally put in a bag and record anywhere I happened to be. It was kind of nuts, but hey, it was an idea that excited me. Alas, at the time that wasn’t possible. But, holy cow, now it is possible. A pro recording studio that can fit in your backpack. Think about that for a second. Sometimes you just have to stop for a second, connect the dots to realize what’s going on around you. So, this is what has been rolling around in my head these last few weeks and I’m pretty pleased to put it together for you here. 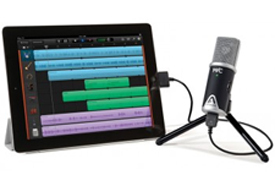 A Studio Quality Home Recording Studio – that fits in your backpack. 1. 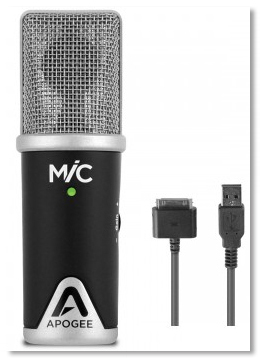 First, here’s the mic for this setup: It’s a condenser mic, a high quality pre-amp and digital audio converter all in one. I’m talking about a remarkable little mic called Apogee Mic Usb Microphone For Ipad, Iphone And Mac (click link to open in a separate page and have a look) or “MiC ” for short. MiC’s built in i/o and pre-amp means there is no need for a separate i/o box or pre-amp in this mini recording studio we’re setting up here. It plugs straight into an iPad, iPhone (via the familiar 30-pin port on iPhone and iPad you use when you are charging). The “MiC” also has the option to plug straight into a laptop or desktop computer via its USB cable. Yes, there are USB microphones out there, but not like MiC. Because it is a studio quality condenser mic, so we can use it with confidence to record lead vocal and acoustic instruments. MiC even has a gain (volume) dial on the side to control the level we send to track. 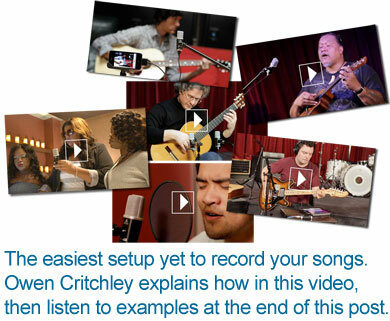 * Listen to examples at the end of this post of projects recorded using the “MiC”. 2. iPad, iPhone or Mac laptop/computer. With iPads costing about a third of the price of a new Mac computer, and with Garageband included free, you’ve got most of your recording potential right there. However, when you add the Apogee “MiC ” (above) and some tiny and very cool studio monitors (below), the pieces are complete. Every album you love, from Elvis to Elton John, Little Richard to Kings of Leon, Aretha Franklin to Arcade Fire, could be recorded with this setup. This setup that you can stick in bag. *Listen to examples at the end of this post of projects recorded using the iPad/iPhone and “MiC”. You can’t tell me this isn’t a golden age for independent recording artists. Ik Multimedia Iloud Wireless Bluetooth Portable Studio Monitor As I point out to the Easy Home Recording Blueprint community, proper monitors are essential for the home recording artist. Accurate playback sound is the only way a decent final mix can be achieved. Powered monitors can be heavy, large and expensive. These monitors are professional quality studio monitors, left and right monitors in a single block, and smaller than a toaster. The price is also small compared to traditional powered studio monitors. 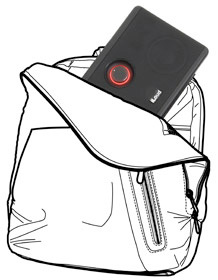 iLoud monitors are also Bluetooth enabled, which means the option is there for you for wireless playback. Less cables. Yay!